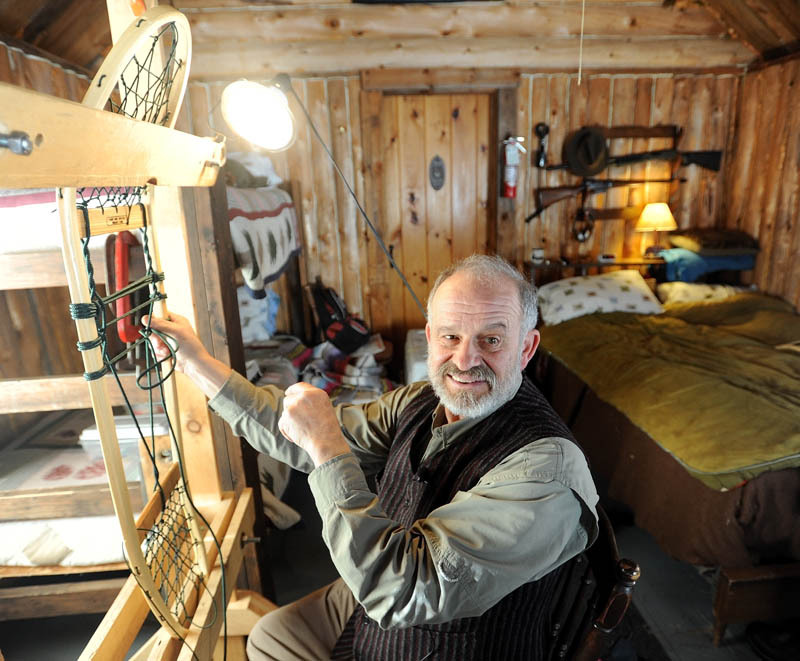 BINGHAM -- In a tiny snow-covered cabin, Dave Giampetruzzi weaves the dark green lacings of a snowshoe between the wooden frame. 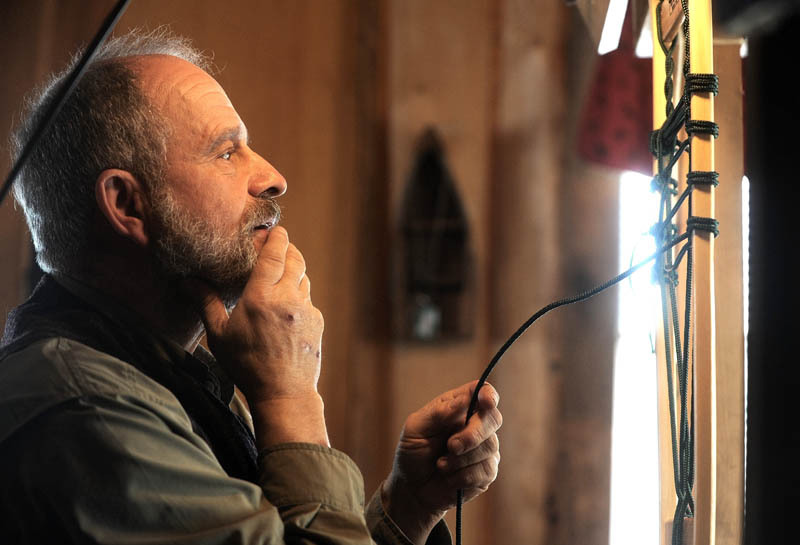 BINGHAM — In a tiny snow-covered cabin, Dave Giampetruzzi weaves the dark green lacings of a snowshoe between the wooden frame. Giampetruzzi, 63, is a veteran who retired from the military in 2008 and returned to Maine, where he went on a hunting trip at Pine Grove Lodge that inspired him to bring the outdoors to other veterans. “It wasn’t so much about hunting as it was about re-energizing and realizing I had some needs at the time. It elevated my spirit so much that I wanted to find a focused way to bring that same feeling to others that had served,” he said. At Pine Grove, a 50-room hunting and fishing lodge, Giampetruzzi learned to make snowshoes, a Maine tradition that has been part of the Pine Grove Program, which lodge’s owners Bob and Andrea Howe created to bring veterans and other service members on hunting and fishing trips as therapy. Snowshoemaking, which is in its second year as part of the program, produces shoes that are sold for anywhere from $190 to $245 a pair and proceeds go toward bringing veterans, firefighters and victims of trauma to the outdoors. It was the creative outlet Giampetruzzi was looking for. “It’s challenging and provides an opportunity for creativity, as well as I think some peace of mind knowing we are helping other veterans in the process,” said Giampetruzzi, who served in Vietnam from 1968 to 1973, joined the Army Reserve in 1978 and also spent a year in Iraq. Giampetruzzi was first introduced to Bob Howe in 2008 after returning from service in Iraq. At that time he was on the receiving end of the program, having come to the lodge for the fall hunting trip. Now he is teaching other veterans to tie snowshoes, a traditional art that Giampetruzzi has learned at the lodge, where he has his own cabin to work in plus a workshop and store that are part of the program. Howe, 57, started making snowshoes himself about 15 years ago and said the program has about 10 to 12 veterans that tie snowshoes either at the lodge or at their homes. They also work with the Charleston Correctional Facility in Penobscot County, where inmates make the frames. He said it is too early to say how much money the program is making but that all the proceeds go right back to the lodge, making it possible for other veterans and victims of trauma to visit and enjoy the outdoors at no cost. Howe said an example is the fishing pond at the lodge, which he stocks with trout bought with money from the snowshoe sales. The snowshoes at the lodge are made from local white ash that is cut into boards about 10 feet long, one inch wide and one inch tall, said Howe. The wood is taken from the edge of the tree where the grain is the strongest and is planed and sanded once it is cut, he said. The boards are steamed so they can be bent into the round toe of the snowshoe. The shape of the snowshoe depends on three things: what it is going to be used for, the body weight of the person wearing it and the type of snow it will be used on, said Howe. Snowshoes are used for hunting, walking in heavy brush, collecting maple syrup or recreationally for walking cross-country, and a person who weighs less will usually wear a smaller shoe, he said. Howe also said there are about 10 different types of snow and it varies depending on geographic location. The lacing of the shoes also has a function — it is designed so that the wearer of the shoe is not carrying around too much snow. 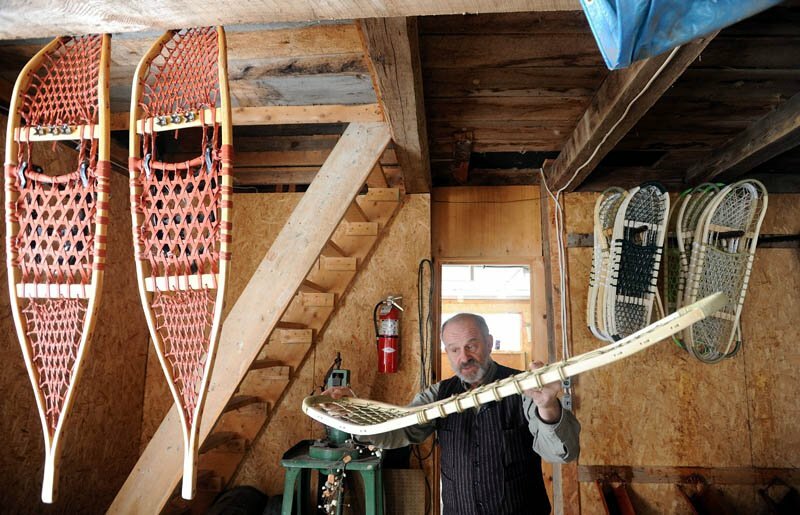 It is one advantage of traditional woven snowshoes over modern aluminum ones, he said. “A person in Alaska, where the snow is heavy, is going to have a much tighter woven snowshoe than someone in Portland where the snow is lighter and fluffier,” he said. After the boards are bent, they are dried for about a week, Howe said. Then holes for the lacings can be drilled and the board can be sanded. The sides can be cut for the toe and heel bar and the shoe is sanded again. It is then ready to be laced. Traditional snowshoes were laced with rawhide but today the veterans at the lodge use lightweight rope in different colors — lime green, pink and yellow. Giampetruzzi said the tying usually takes about two hours per pair of shoes, and then they are dipped in polyurethane three times to stiffen the lacings and preserve the wood. “Once that’s done and they’re dry, they’re ready to go,” said Giampetruzzi. The shoes are sold online or at one of the many shows and fairs Howe travels to. They are also used recreationally by visitors to the lodge who want to explore the woods or by people, like Howe, who rely on them to make a living. As a hunter, Howe said he is in snowshoes from late November sometimes through April, when there may not be snow left in parts of Maine such as Waterville and the south but there is still snow in the mountains. “A lot of people make their living in the snow. Biologists, hunters, fishers, for them these shoes make a difference,” he said. For others, the art of making the snowshoe is a reward in itself. Terri Perry, 43, of Gorham, an Air Force veteran, began making snowshoes at the lodge last year. A diagnosis of multiple sclerosis and a car accident with a moose in Alaska put her in a wheelchair and she isn’t able to work, but she said making the snowshoes provides her with a sense of accomplishment. “It took a while to get down the pattern and the measurements. There’s definitely a learning curve but I love doing it. It’s a really rewarding feeling,” she said. In the lodge, which is decorated with antlers, pine boughs and a leftover Christmas tree, Giampetruzzi relaxes with a cup of hot coffee after a morning of tying snowshoes.